Bar None is one of the oldest mixed drink sites on the 'net. If you're looking for a cocktail or shooter, we probably have the drink recipe here. Other features that we're proud of include drink recipe tips, a home bar section, and a wide assortment of drinking games. 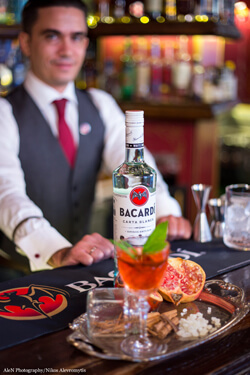 George Megalokonomos crafted this cocktail for the 2016 Bacardi Legacy competition. His source of inspiration was the city of Smyrna and its people, the Greeks who lived there until 1922 when they were violently deported by the Turkish army. 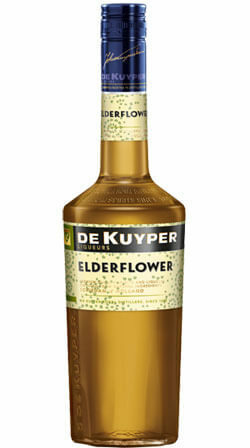 Made from an extract of brittle blossom, this delicate liqueur stands proof for DeKuyper's craftsmanship. The elderflower is so fragile, the blossom is almost impossible to process without losing its fragrance. If you know the name of the cocktail, shooter, punch, hot drink or non-alcoholic recipe you need, use the index to surf via category and name. All of our recipes are listed here. Here are all of our drinking games from the latest creations to the old classics. Browse by category, search by name or allow us to suggest a random game to try. Everything from articles, reviews, equipping your own bar, techniques for mixing and other references as well as our Ingredient Dictionary. The Dictionary contains definitions or descriptions of almost all the ingredients in the recipes database.